Welcome to Chaz Boxers! 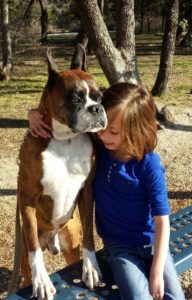 We’ve bred and shown boxers, on a limited basis, since 2004. All of our dogs are cared for in our home as part of our family. We do not often breed our dogs but when we do we believe in doing things the right way! We carefully consider health, temperament, and conformity to the breed standard when making all of our breeding decision.